There is something incredibly relaxing about cruising on the Chobe River, along the banks of the Chobe National Park, watching the outstanding wildlife and birdlife whilst onboard the Zambezi Princess. 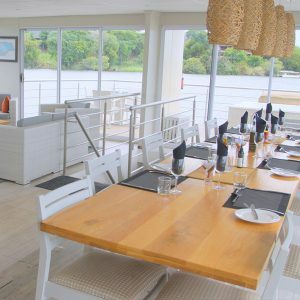 With only a small number of guests per boat, the Zambezi Princess is like being on your very own houseboat; you may envision it as your very own private villa on the water. As you drift down the Chobe River and spot incredible wildlife scenes, you’ll be able to completely relax in the Zambezi Princess intimate river safari experience. With a minimum of three smaller “tender” boats for use on daily excursions that take your fancy, you may mark off over 450 bird species found in this wetland paradise, try your hand at landing a tiger fish, or capture Africa’s unique beauty on a photographic safari. Whatever you choose to do, your day trips will be personal and flexible because you’ll be sharing the tender boats with a small number of guests. Alternatively, simply laze on a deck chair with an ice-cold drink in hand as you soak up the tranquility that surrounds you. Each cabin on board the Zambezi Princess is tastefully decorated in a contemporary style, and each has its own private view onto the ever-changing landscapes beyond. As you lie on your king-sized bed, spot an elephant grazing on the riverbank nearby, or see a fish eagle diving for its prey. On the upper entertainment deck, a spacious lounge and bar area encourages you to take time out while there’s also a plunge pool that’s perfect for a refreshing dip. After a day spent doing as you please, fall asleep with the calls of hyena or even a lion drifting through the open doors of your cabin.